On the last day of His human Life, Avatar Adi Da Samraj completed His most pristine and comprehensive text, The Aletheon. The Revelation Magazine begins to celebrate its publication with excerpts from the text and commentary on its creation — including a video presentation by Avatar Adi Da's senior editorial assistant with extraordinary images of Avatar Adi Da working on The Aletheon. This video is also available through the linked photographs on pages 2 and 3. The Aletheon is the Divine Self-Confession of Reality Itself. It is thus a profound gift to all beings — a supreme masterpiece of wisdom, instruction, and Divine Self-Revelation. In combining with The Aletheon, the world is forever able to receive Avatar Adi Da's Transmission-Communication of Reality and Truth. In The Aletheon — which He Himself designated as His "First and Foremost" Reality-Communication to all — Avatar Adi Da utterly relinquished His previous mode of Self-Submission to human egoity, and made only His own purest Communication of Truth. Such is the unique quality and purity of this greatest of His Teaching Gifts. The Aletheon includes Avatar Adi Da's "radical" Criticism of ego-life and His penetrating Consideration of true and false understandings of God, religion, and human existence altogether. It includes His unique Revelation of the Divinely Enlightened Condition and His Divine Self-Confession of His own Purpose and Work. And it includes His summary description of the practice He Offers to all who are moved to become His devotees. 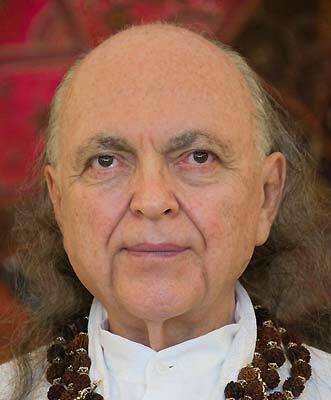 Thus, The Aletheon is the Supreme Scripture for all time — the final Gift of Word from the very Divine Reality Itself, who Avatarically Appeared on Earth as Avatar Adi Da Samraj. During the final three years of a Lifetime that had been utterly devoted to the Communication of Truth, Avatar Adi Da created His supreme Scripture. Day after day, month after month, Avatar Adi Da sustained a vast flow of spontaneous writing — moved by His indefatigable Impulse to "say everything" to everyone. 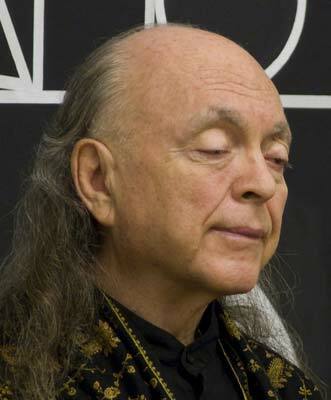 In keeping with the unique and profound purpose of this final book, Avatar Adi Da eventually chose to name it The Aletheon (pronounced "a-LAY-thee-on"). The title was His own coinage, based on the ancient Greek word for "Truth" — "Aletheia". Thus, this last and greatest book by Avatar Adi Da is, simply, "the Truth Book". With His final Work on the title page of The Aletheon, on the morning of His Divine Mahasamadhi, He forever brought to a close His final great writing-labor of Love. 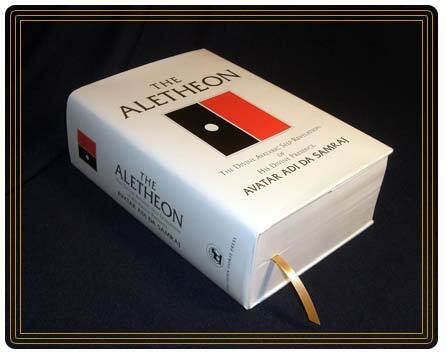 Over 2300 pages, The Aletheon is available in two editions: a single-volume hardbound edition and an eight-volume softbound edition. The contents of the two editions are identical — including the full text of The Aletheon, over one hundred photographs of Avatar Adi Da (most of which are published here for the first time), a full biography, and extensive reference materials. Both editions come in a beautiful slipcase adorned with the Parama-Sapta-Na Logo-image, created by Avatar Adi Da Samraj. Details about purchase can be found below. — one in which Ruchiradama Quandra Sukhapur Rani, senior member of the Ruchira Sannyasin Order, describes the quality of the final years of Avatar Adi Da's Life, during which He Accomplished this great Work; another in which she describes Avatar Adi Da's Completing Work on The Aletheon in the days preceding His Passing from the Body. — the contents reveal the incredible breadth of Avatar Adi Da's Aletheon-Communication, and give us a glimpse of the pattern of Revelation that governed the placement of each essay within His vast Scripture. Reading just the titles of the essays in the book allows the reader to participate in Avatar Adi Da's potent Transmission, even without further detail or explanation. "The Forever-Spoken Word of Reality Itself"
— an essay from Part One of The Aletheon. Here Avatar Adi Da offers insight into the purpose and process of His Aletheon-Gift, and of His written Word altogether. We encourage you to participate with Him directly in this essay — by listening and feeling (rather than merely thinking) — and to discover, in each moment, the living process into which He Invites you through His written word. — a new department within the Adidam Revelation online Magazine — where we welcome you into ongoing study and exploration of The Aletheon.